Real Rocks Are Heavy and Hard to Find, on view at Gallery Four, is a collaboration between James Bouché and Ryan Syrell. 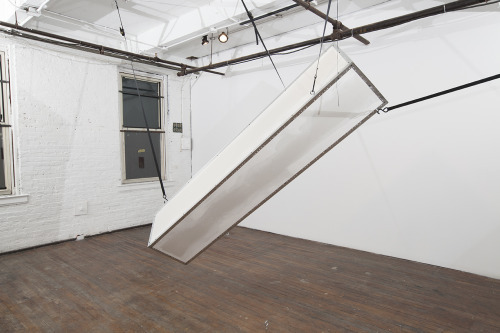 The show translates familiar materials through a grammar of signifiers that Bouché and Syrell have developed to address ideas of time, illusion, reflection, and process. From the moment the elevator doors open directly into the space, I lose all sense of the typical feelings of anxiety that permeate most of my art-opening experiences. So much consideration has been given to the arrangement of the space that it becomes impossible to focus on anything but the work. This is a strong, ambitious show. Syrell and Bouché address the ubiquitous material object in a way that both highlights and obscures its materiality, showing us works that become more than themselves, or the ghost image of themselves. This can be seen in a series of five pedestals that are arranged in a linear alignment throughout the course of the show, moving in gradient from light blue to black. Displayed on each pedestal is a grouping of bricks and rope that have been subtly transformed from conventional materials into a new object that feels simultaneously familiar and unknown. I laughed when, while studying the obliterated homage to Maso di Banco’s St. Sylvester (a 14th century fresco), a fellow visitor leaned over and asked me if the work was part of the show. I could only assume that he was confounded by the presence of a Renaissance painting amongst domestic building materials. By the way, the only information yielded from my research of this painting was that St. Sylvester slew a dragon that was killing a lot of people with its toxic odor. I appreciate these hidden jokes within the works. Here and there, little remnants of blue tape are left behind, feigning intentionality within the context of the expertly installed works they accompany. In the final room of the show, pieces of sandpaper are treated with a sawdust flocking that form caricature-like references to Bouche and Syrell’s collaborative works. These are also available in a folio as a take-home set. The work is technically and structurally on point while still retaining the feeling of an intuitive process. Forms are placed in orientations of constant activation by the preexisting architecture of the space. And the space itself is one of the most brilliantly present aspects of this show – every element is considered, engaged, and negotiated. Implications of structural elements are placed centrally in every room, giving the feeling of potentials – objects caught in the act of fulfilling their latent capabilities. 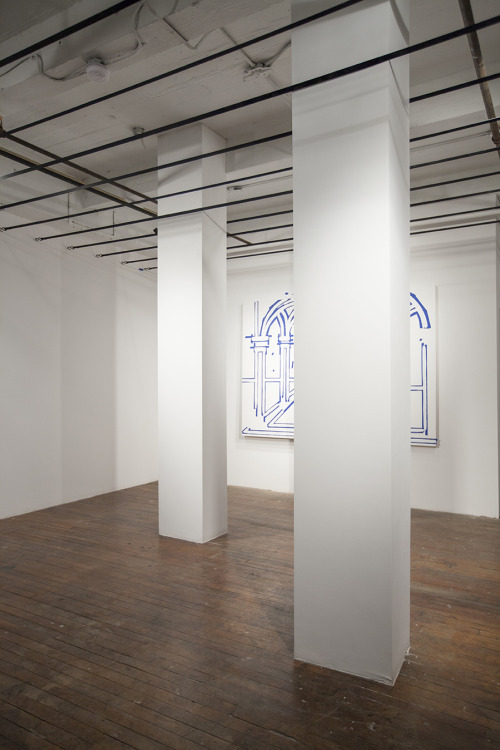 By repeated use of columns and arches (and the literal or probable acts of obliteration connected to these objects), Syrell and Bouché subvert an architectural canon that is buried deep in our subconscious. It surprises me that I’ve gotten this far without talking about my favorite work in the show: a piece simply titledDrywall. On a large wall, tinted joint compound creates a three-dimensional grid that is so optically deceiving that my eyes would not believe it was flat even as I stood inches away. Full disclosure: I’ve spent the better part of a year obsessing over the binary relationship between the eyes and the brain created by optical illusions. 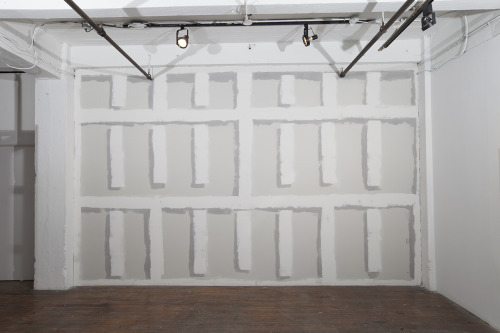 Drywall interprets these complex principals using the most basic materials; this juxtaposition of conceptuality and universality perfectly exemplifies the statement written by the artists for this show. Bouché and Syrell refer to the “threshold of art” as the resting place for the work, speaking of an intuitive making process that is dictated by materials. Their quest for de-individualization is a noble one, although it’s impossible not to pick up on various cues that reference each artist’s personal practice. But I think that’s ok – their two voices are never dissonant together.